Robert Brown (left) has helped several of his former students establish medical technology companies. 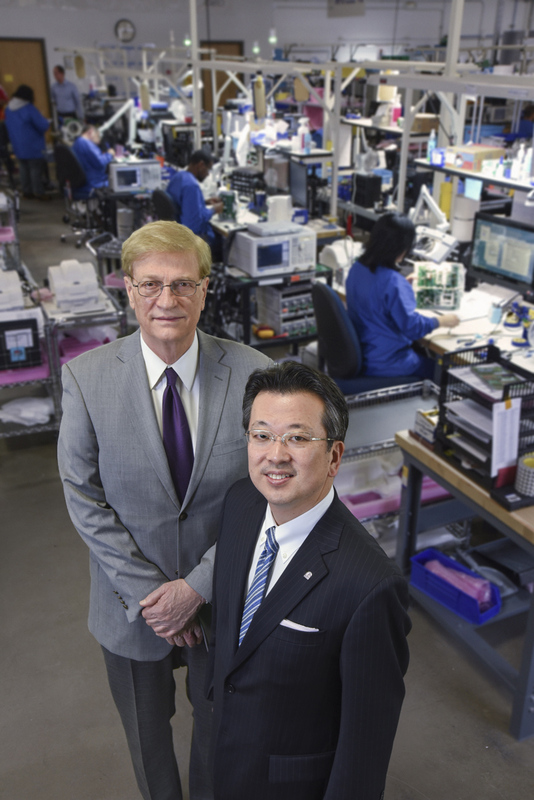 Hiroyuki Fujita (right) is the founder, president and CEO of Quality Electrodynamics (QED), a manufacturer of radiofrequency coils for MRI machines. Since it opened in 2006, QED has grown rapidly; it has more than 150 employees and occupies a 77,000-square-foot facility in Mayfield Village, Ohio. Photo by Mike Sands. Brown, however, also credits his students with profoundly influencing him. One example particularly stands out. In 1982 a former postdoc and a graduate student who had taken his classes were working for a local medical imaging company, and they came to Brown with a request. They wanted his help in improving the radiofrequency coils used in magnetic resonance imaging (MRI) machines—devices that were becoming increasingly common in hospitals and other medical facilities. Brown was a particle theorist at the time, studying the forces inside the atomic nucleus. He was operating, in other words, pretty much at the opposite end of the physics universe from applied medical research. But he was open to new challenges. And it turned out that the computational skills he had developed for simulating how particles behave in giant colliders were highly useful for studying the complex electric and magnetic fields at the heart of MRI technology. At first, Brown thought this would be a short-term project. But he got hooked on the thrill of having an impact in medicine. As he came to appreciate industry’s vast need for his—and his students’—quantitative skills, improving medical technology became his primary mission, leading to more than 200 peer-reviewed papers, 10 patents, 26 doctoral theses completed under his supervision and the mentoring of more than 100 research students at all levels, including undergraduates. He has also played a major role in founding or setting the direction of five manufacturing companies, employing from 40 up to more than 300 people—including many of his former students. This spring, Brown taught a special undergraduate seminar, Physical Review A-Z, designed to cover the whole landscape of physics. His students included Nicholas Ramey and Adele Zawada. Photo by Mike Sands. Brown’s contributions also extend to the classroom, where his creativity and dedication have earned him an array of teaching awards. 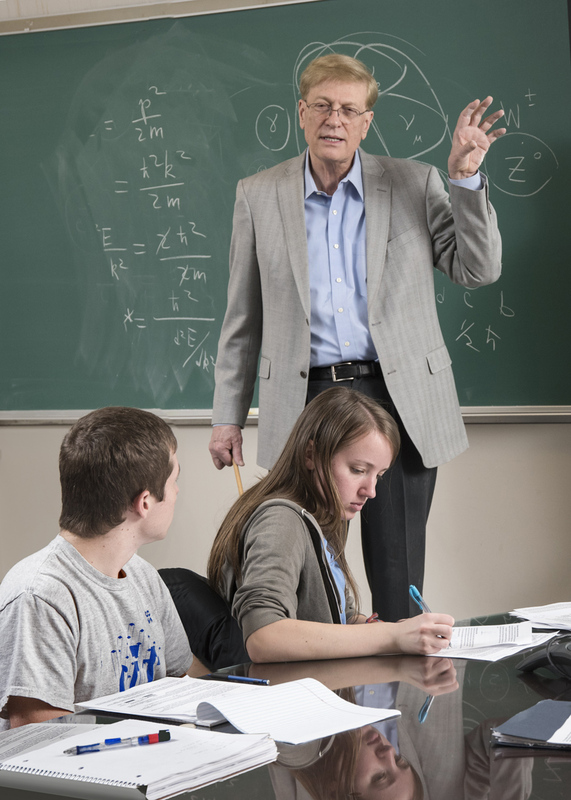 In recognition of his exemplary record in research, teaching, mentoring and service, Brown was named a Distinguished University Professor in 2011. Brown became fascinated with the solid-state technology in the transistor radios and other devices that were appearing during his childhood. Like many young people of his generation, he was also inspired to pursue science and engineering by the wave of interest and funding that poured into those fields after Sputnik launched in 1957. One of Brown’s professors convinced him to leave home for graduate school, so he went off to MIT, where he earned his doctorate studying how electrons and their antimatter cousins, positrons, interact with protons. He then headed to Brookhaven National Laboratory on Long Island for a postdoc in particle physics, before being recruited to Case Western Reserve in 1970. At the time, physicists were putting together the Standard Model, which describes physics at its most fundamental level. Brown did studies at CWRU suggesting ways to detect and investigate subatomic particles called W bosons, which mediate the weak nuclear force that gives rise to radioactivity. Physicists had just recently developed a way to bring together W bosons and all other known subatomic particles in one theory, and some of Brown’s papers formed the basis for major experiments at Fermilab that probed these still-mysterious particles’ properties. Along the way, Brown started training graduate students. That set the stage for the 1982 project with E. Mark Haacke, who had done postdoctoral work in theoretical high-energy physics with Brown, and John Patrick (GRS ’83, MGT ‘93), who would soon complete his doctorate. They were doing research for Picker International, a company that had made its name selling X-ray machines and was just getting into MRI—the safe, nonradiative, noninvasive imaging technology that had been co-invented less than a decade earlier by future Nobel laureate Paul Lauterbur (CIT ’51). This magnetic resonance image is tuned to highlight the corpus callosum, a bundle of nerve fibers by which the left and right hemispheres of the brain communicate. 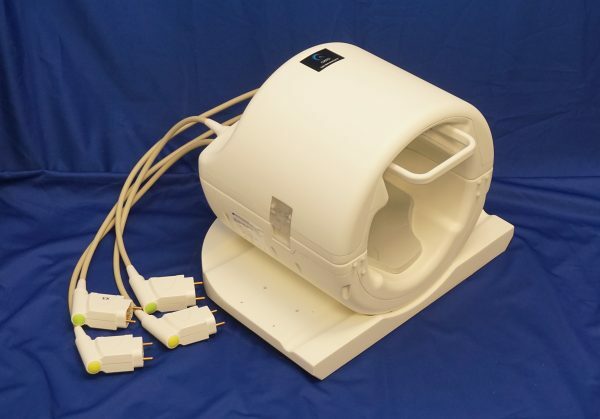 The MRI machine that produced the image is equipped with a radiofrequency coil designed and manufactured by QED. Photo courtesy of Cleveland Clinic Foundation. After building a unique reputation as an MRI hardware researcher based in a physics department, Brown in 1993 helped form a company, USA Instruments (USAI), that manufactured MRI coils. Two years later, he joined Haacke in founding MRI Innovations, a producer of software that turns MRI data into images. Both companies took off: USAI was eventually acquired by GE Healthcare, and MRI Innovations is now headquartered in Detroit, with Brown as its vice president. Instead, Brown became what he calls a “stay-put entrepreneur.” He serves on boards of companies, and sometimes shares patents. But he also continues to teach and advise students, and he pursues fundamental physics research, essential for developing new technologies, that companies often can’t afford to do. Much of Brown’s present funding for these projects comes from Ohio Third Frontier, a state initiative promoting collaboration between academia and startups. Brown saw a further opportunity to unite his passions for research, mentorship and entrepreneurship in 1999, when Taylor, who was then a full-time faculty member, launched a master’s degree program in physics entrepreneurship. Taylor’s vision was to combine advanced science instruction with business courses, equipping students with the skills they would need to work in industry and perhaps start their own companies. “I think we have an obligation, as part of our mission, to try and foster technological and scientific developments that will have a positive impact on society as a whole,” Taylor says. Since then, the program has morphed into STEP, with tracks in biotechnology and chemistry as well as in physics, and Brown has connected many of its students with local internship and career opportunities. In the process, says Caner, he has helped make Northeast Ohio a mini-Silicon Valley devoted to medical technology. QED’s high-field-strength (7-Tesla), multi-channel head coil is used to produce high-resolution brain images, both for medical purposes and for neuroscience research. Such images can help physicians diagnose diseases such as multiple sclerosis. 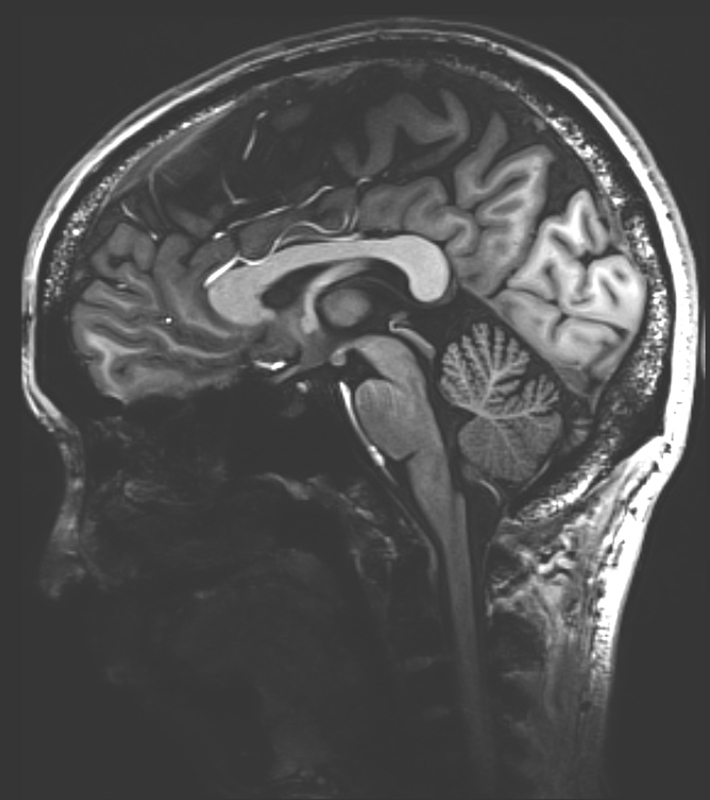 Functional magnetic resonance imaging (fMRI) enables scientists to study the regions of the brain activated when we engage in various motor or cognitive activities. Photo courtesy of Quality Electrodynamics. Today, Brown is engaged in research collaborations with several MRI-related companies—a situation that could lead to conflicts of interest. But he says that these firms rarely compete with each other, and indeed he is often able to link them together for mutual benefit. For example, both GE Healthcare (which acquired USAI) and ViewRay, another firm Brown is involved in, now buy coils designed and manufactured by QED. “One of the things that Bob Brown has been fantastic at has been to get these relationships going and build up trust,” says Professor Michael Martens (CWR ’87, GRS ’91), who earned his doctorate as a member of Brown’s research group and rejoined it in 2011 after his appointment to the physics faculty. Brown’s entrepreneurial inventiveness has spilled over to his teaching. 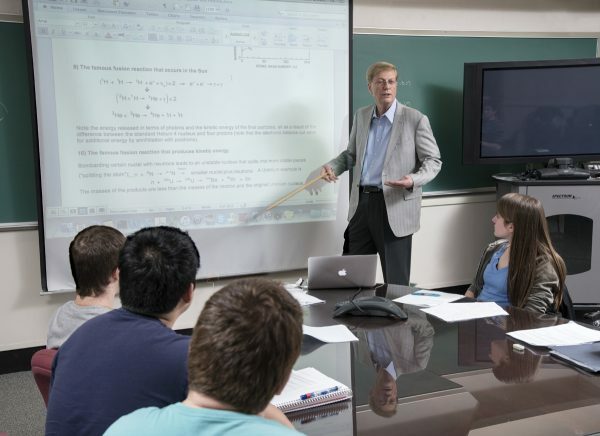 During the mid-2000s, he noticed that students who had taken his introductory physics class often seemed to forget what they had learned as soon as they handed in their final exams. In response, he designed a curriculum that revisits concepts three times over the course of a semester, delving deeper each time. This method, which Brown calls “cycling,” departs radically from the linear approach adopted in nearly every physics course. “I have a better conceptual understanding of physics because of Bob’s teaching,” says Lisa Bauer (CWR ’09, GRS ’16), who took Brown’s course as an undergraduate and recently finished her doctorate in physics. The undergraduates in Brown’s seminar this spring studied with the flash cards he created to help students prepare for the GRE subject exam in physics. Photo by Mike Sands. Brown also noticed that undergraduates were struggling with the GRE subject exam required for entry into most physics graduate programs. The exam requires that students master a large body of physics content at a relatively shallow level. It occurred to Brown that an old-fashioned pedagogical device—flash cards—would reinforce that type of learning. So he developed a set of physics flash cards that his department and, more recently, the American Physical Society have distributed to thousands of students around the world. As a result, the cards (now available as a web app) have been used by a sizable fraction of the 5,000 to 6,000 students who have taken the physics GRE during each of the past three years. Speaking from personal experience, Martens vouches for Brown’s devotion to undergraduate education. “The whole reason I’m here today is because of his mentorship when I was here as an undergrad,” he says. Brown encouraged Martens to pursue a doctorate in physics, and the two scientists stayed in touch for the next 20 years as Martens built a career at Fermilab. Finally, Brown recruited him back to his MRI group at CWRU. Brown continues to pour energy into pushing MRI technology forward. He and Martens, in collaboration with Columbus-based company Hyper Tech Research, are studying a superconducting material called magnesium diboride, which could enable MRI coils to operate at higher temperatures using less of the precious liquid helium now needed to cool them. Along with Kara, Brown is also working with Mark Griswold, professor in the Department of Radiology and director of MRI research in the CWRU Schools of Engineering and Medicine, to help improve a novel technique that Griswold and his research group invented. Magnetic resonance fingerprinting takes a patient’s MRI data and compares it with patterns characteristic of certain diseases. The goal is to make diagnoses much more precise and less dependent on a particular doctor’s interpretation of an MRI scan. In a third project, Brown is collaborating with Shmaryu Shvartsman, principal scientist at ViewRay and an adjunct professor in the physics department. They are seeking to combine three procedures—imaging a tumor, taking a biopsy and administering radiation treatment—in one session, decreasing both the cost and the trauma to patients. Shvartsman is one of a half-dozen scientists with doctorates in other areas who came to CWRU to retrain with Brown in imaging physics. Even Brown’s early work in particle theory continues to live on. His group’s seminal W-boson papers are the basis of present and planned experiments at the Large Hadron Collider in Geneva. Recent reports on a discrepancy between theory and measurements of the size of the proton have cited results in Brown’s doctoral research to help resolve the anomaly. And Brown has found that current discoveries of unexpected simplifications in quantum field theory may in fact be explained by other papers he and his collaborators published 30 years ago. He is presently trying to connect the new and the old work, with former students as co-investigators. Related Link: Hiroyuki Fujita, founder, president and CEO of Quality Electrodynamics (QED), was the subject of an art/sci profile in 2011: artsci.case.edu/magazine/2011/an-entrepreneurial-spirit.